Elisabeth Welch was a singer, actress, and entertainer, whose career spanned seven decades. Her best-known songs were Stormy Weather, Love for Sale and Far Away in Shanty Town. She was American-born but was based in Britain for most of her career. A masterful cabaret singer and stage performer, Elisabeth Welch was one of the African Americans born near the turn of the twentieth century who made their careers abroad. In her case, this decision to work overseas seems not to have been so much a deliberate choice as it was a matter of the availability of work. Until the 1980s many Americans were only partially aware of her work, knowing her as a singer in shows and cabarets in the United States in the 1920s and early 1930s. However, she later became a genuine star in England with a substantial career. Only when she returned to New York in 1980 to begin performing again in this country did Americans become really aware of the quality of her work and discover a living link with some of the great names in American musical theater--a link, moreover, whose performing abilities were still substantially intact at an advanced age. Even before she graduated from high school, Welch was singing in the choruses of shows. In the London Times interview, Welch said that when her father discovered that she was participating in real stage shows with the silent support of her mother, he walked out on the family, saying, "Girlie's [Welch's nickname] on the boards--she's lost." Her first appearance was in a short-lived musical called Liza in 1922. It introduced the Charleston to New York when it opened on November 27, but the dance made little impression at the time. In 1923 Welch won a spot in the chorus of Runnin' Wild, which made the Charleston into a craze. Welch was picked out of the chorus to sing "The Charleston." However, as she pointed out in the 1980 New York Times article, "Singing `Charleston' meant nothing to me. It's really a dance. It's not a song you can get up and sing." She continued to work in choruses of shows, including Chocolate Dandies and Velvet Brown Babies of 1924. Welch then returned to England at the invitation of Cole Porter to appear in the show he was putting on in London. It was in England she made the rest of her career. This was not part of a plan. She explained to David Lida for Women's Wear Daily, January 28, 1986, "I never intended anything in my life. People don't understand that, but I've just drifted in and out, in and out. I had no star that I looked for or followed. My whole life has been--an event." In London Welch was first principal singer in Dark Doings in June 1933, a show she performed in while waiting for Porter's show to open. She stopped the show four times a day with "Stormy Weather," introducing the song in England just a week before Duke Ellington's first appearance there. That same year Cole Porter wrote the song "Solomon" for her. She performed it in his Nymph Errant, starring Gertrude Lawrence, to such success that the song became identified with her and was played for her wherever she went. Welch appeared in the movie Revenge of the Pink Panther (1978) and in Derek Jarman's strange film The Tempest (1979), playing the Goddess and singing "Stormy Weather." She explains the film by saying, "It's Shakespeare's lines, but a lot of it was cut, and there's a lot of nakedness in it. Jarman always likes to have naked boys in there. I didn't appear naked, but a very big lady did--Caliban's mother." Welch entered the recording studio in 1987 to record Sings Irving Berlin for Verve; the record was released in 1988 to high praise. There was also a retrospective compilation, Miss Elisabeth Welch (1933-40), in 1979. Three other albums appeared in the 1980s: Elisabeth Welch in Concert (1986), Where Have You Been (1987), and This Thing Called Love (1989). 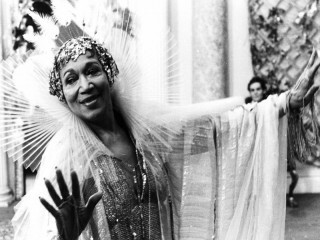 In 1989 she appeared in a one-night concert performance of Nymph Errant, in which she had first sung "Solomon" fifty-six years earlier. Elisabeth Welch had an outstanding and long-lasting career. She reminds her listeners of the great show and cabaret singing tradition that flourished in the years Irving Berlin and Cole Porter were writing for the stage, but at the same time she has survived into very different times. Only the onset of old age has been able to slow her down. Clive Barnes, the New York critic who also heard her while he was growing up in London, summed up his impressions in the New York Post, March 24, 1986: "Welch is an original. With her sweetness, her gentility, arsenic-laced with a sense of roguish innuendo and pagan sensuality, she is like no one else.... She has class, and class, and class. A saloon singer who would make any saloon into a salon." Welch died on July 15, 2003, in London, England. View the full website biography of Elisabeth Welch.